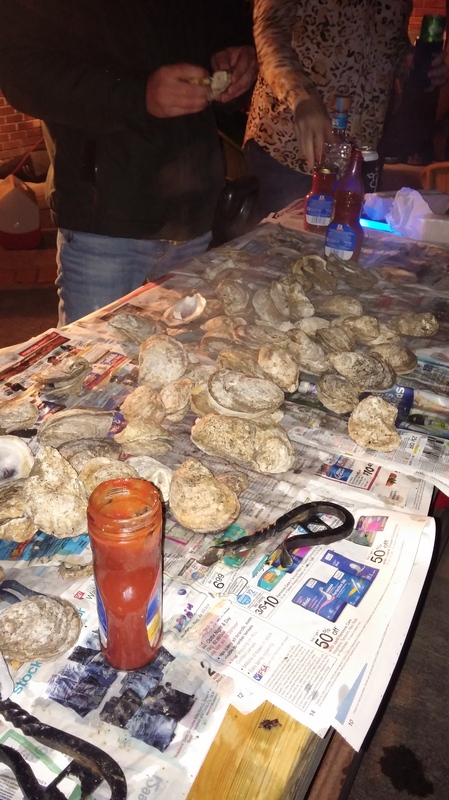 An oyster roast is one of the most casual ways to throw a coastal party while highlighting the sea’s bounty. In my mind, coastal Georgia and everything that comes along with it–like Lowcountry boil parties and oyster roasts–is next to Jesus. 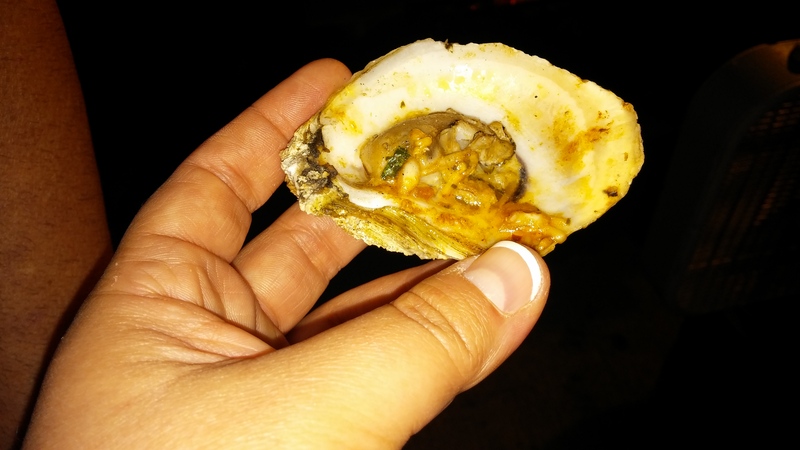 With my Holiday Cheese Ball in tow, I attended my first oyster roast in Savannah recently and ate my fill of the slippery, salty mollusks. 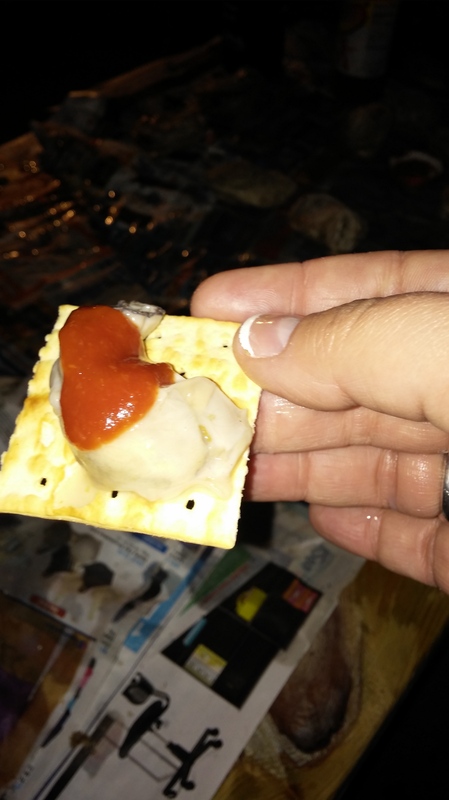 The New Year’s Eve get-together was a fantastic way to say goodbye 2014 and hello 2015, while at the same time learning a thing or two about how the locals throw a sho’ ’nuff (sure enough) shindig. A metal sheet is placed over the outdoor fire pit, perfect for steaming the oysters. Longtime Savannah food writer Martha Nesbit describes the scene at an oyster roast perfectly in her cookbook, Savannah Celebrations. “Singles or clusters are roasted over a sturdy piece of steel placed over a roaring fire. 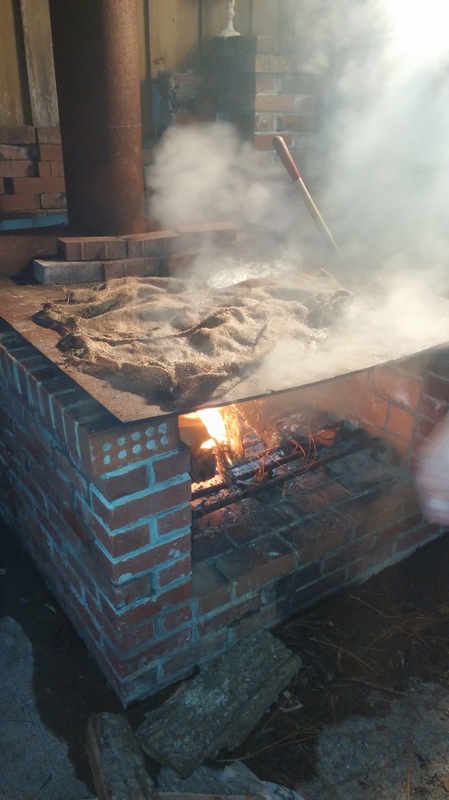 The oysters are covered with a burlap sack, which is hosed down; the oysters steam underneath. The oysters are ready when they pop open; the cooks have the responsibility of shoveling the oysters from the fire to the table, which is usually wooden, at least waist-high and unadorned.” I couldn’t have said it better myself! Oysters on the half shell grilled on the Big Green Egg. The host and cook behind these bad boys was my friend Kyle Byrd. He grilled these oysters on the half shell with garlic butter, lemon, Worcestershire sauce, fresh herbs and hot sauce on the Big Green Egg. Some Kinda Good, what you talkin’ ’bout! 1. Nearly two billion pounds of these mollusks are eaten every year. 3. Eating four to six oysters a day provides a complete daily supply of copper, iodine, iron, magnesium, manganese, phosphorus and zinc. Oysters are one of the most nutritionally well-balanced of foods, containing protein, carbohydrates and lipids. The National Heart and Lung Institute suggest oysters as an ideal food for inclusion in low-cholesterol diets and an excellent source of vitamins. 4. Norwegian Rune Naeri set the Guinness World Record for the most oysters eaten in 2003: He devoured 187 in three minutes. 5. The largest oysters can grow up to three feet long in shell length. 6. Depending on the location of their cultivation, there are significant differences in the flavor profiles in the oyster. East Coast oysters tend to be more briny while West Coast oysters tend to be sweeter. 7. Almost all oysters can secrete pearls, but not all are valuable. The pearl oysters come from a different family than edible oysters. What fun facts would you add to my list?